In January, Bill Brooks and the Urban Times staff brought together each of the historic neighborhoods in the papers’ circulation. Each neighborhood was given the opportunity to talk about their community: what’s working, how they gather neighbor feedback, what challenges are being faced. I was proud to stand up and say that Woodruff Place has over 175 active members in our Civic League, up from 67 in November. Which leads me to what I ranked as my number one thing that we do really, really well: We organize. Cleanups, events, fundraising campaigns, meal trains, committees, boards and of course the implementation of the Economic Improvement District. Our neighborhood volunteer ranks are incredibly complex but we’re all working towards the goal of preserving Woodruff Place for the next generation of Woodruffians. At our last general membership meeting, Doreen Tatnall shared a brief history of density reduction efforts over the past 35 years in which the neighborhood and individual neighbors have collectively reduced the housing stock in Woodruff Place by over 140 units. This is not because we are opposed to apartments, but we are in favor of preservation and returning these properties to their original intended use. Our neighborhood is listed on the historical register due to the gathering of unique architectural styles, and we could not be more proud than to act as stewards to this amazing place we call home. First, I want to take a moment to thank all of those who came out to the meeting last week. It was very beneficial to hear thoughts from our neighbors surrounding the proposed sober living house at 608 Middle Drive. Many of you offered up great thoughts, ideas, and things the board had not even considered, just as we hoped you would. As a result of that conversation, the Civic League board met on Wednesday, December 20, and created the Woodruff Place Civic League Land Use Special Committee (WPCLLUSC). The volunteers for this committee are Bill Longest (chair) from the Foundation board, Terri Carney from the Civic League board, Vanessa Javé-Lowry (adjacent homeowner), Rachel Pendleton, Kurt Tornquist, Paul Russell, and Monica Thompson-Deal (in an advisor role). Their first committee meeting will be 12/27/17. In looking at whom to appoint to the committee, we looked at those who volunteered to serve and tried to select individuals who appeared to sit on all sides of the issue and who could offer additional understanding to benefit the committee. They have all agreed to tackle this task, and I ask that we all give them the support they need to create a recommendation to the board and the Civic League members. You can all be assured that if there is an actionable item, you will get a chance to vote on the direction that is taken. On that note, I want to take a moment to apologize. It was NEVER the board’s intent to keep anything from the neighborhood or take sides. The intent was to gather the information we could from the new owner/operator, share that with the neighborhood, get the neighbors’ views, and determine next steps. We had a fact-finding meeting with the operator within a week of finding out what was proposed for 608, sent a letter containing that information to the neighbors within two days, and scheduled the information meeting for as soon as we thought feasible. We are working as quickly and effectively as we know how. In hindsight, I wish we would have had the owner/operator compose a letter to the neighborhood explaining their intent, instead of summarizing the conversation we had with them. That might have cleared up some of the feeling that the board had taken a side and was not just sharing information. The start of a new year represents a fresh start. Even though we have a mountain of additional answers to seek, I ask that we do it together. We may currently have the highest number of members in the history of the organization. Let’s put it to good use. Happy New Year to each one of you and your families. In August, a survey was circulated to Woodruff Place residents through the newsletter and Facebook seeking input regarding the wonderful $5,000 award received from Local Initiative Support Corporation (LISC) Indianapolis as part of its 25th anniversary program. The Woodruff Place Economic Improvement District (EID), the only successful initiative of its kind in our region, was selected as the Livability award recipient. The EID board, which is responsible for determining how the money will be used, reviewed the survey results in September. The clear favorite, chosen by 65% of respondents, was the option to install existing statuary for one of the smaller fountains. It is currently stored in the Town Hall basement. The EID board voted to use the money for this purpose. Many steps need to be taken before it can be accomplished: installation and additional components costs need to be determined, and additional funding may be needed. Research is underway to determine if a grant can support this effort. We would like to thank all of the survey participants for their input. Woodruff Place is unique among Indianapolis’ historic neighborhoods in that it was not only Indianapolis’s first suburb but was a separate town for almost 100 years before being absorbed into Indianapolis in the early 1960s. As master planned by James Woodruff in the early 1870s, the Olmstead influenced development included esplanades filled with statuary and urns, nine fountains, historic streetlights, an ornate concrete 10th Street wall, and eventually a large town hall. After Indianapolis annexed Woodruff Place, the city maintained this historic infrastructure over the years with a steadily declining amount of effort and care. Woodruff residents began assuming responsibility for this maintenance through extensive volunteer involvement and successful fundraising events like the annual flea market and biennial home and garden tour. However, it became increasingly clear that the level of maintenance, repair, and improvement of this infrastructure was well beyond the scope of these fundraising activities. It is interesting to watch Downtown Indy pursue an Economic Improvement District since Woodruff Place successfully created an EID in 2016. Through an EID, property owners agree to be “taxed” a relatively small amount per year to be directed toward a specific purpose overseen by the City Council and a locally appointed EID board. For Woodruff, this is our historic infrastructure. The Department of Public Works has promised to match the EID money for five years. For Woodruff, this has been a godsend since we have had to replace the Town Hall roof and redo the back wall and run new electrical service to the West and Middle Drive fountains in the last two years. These projects have cost tens of thousands of dollars. However, EID funding is restricted to certain types of projects. Foundation funds pay for important projects that the EID cannot fund. In 2017, that has included treating more than 50 public ash trees, part of the Town Hall stucco restoration, and a new section of the 10th Street Fence restoration. Funds raised this fall will be pay for similar projects in 2018. This is why Foundation fundraising is so important. We urge residents and interested nonresidents alike to make tax deductible donations to the Historic Woodruff Place Foundation. These can be made online at http://www.woodrufplace.org or by check made to “Historic Woodruff Place Foundation” and sent to Town Hall at 735 East Dr. (or dropped in the mail slot!). Thank you for supporting the neighborhood generously with your time, money, and spirit! Woodruff Place is unique among Indianapolis historic neighborhoods in terms of our amazing historic infrastructure that beautifies our urban village. But with these treasures comes a tremendous responsibility to maintain and enhance these resources. The implementation of our Economic Improvement District and the funding that has resulted has certainly helped and will be a godsend for the future of the neighborhood. However, the expense of maintaining and improving this historic infrastructure as well as the ongoing operational expenses of the neighborhood are substantial. This is why the Woodruff Foundation will be making two major fundraising pushes this year. Funds raised will be critical in meeting our plans for the coming year related to our infrastructure and we will seek to recognize our neighbors who will contribute to this important effort. But a financial donation is only one way neighbors contribute. Woodruff Place is renowned for our volunteerism. The untold person hours that neighbors contribute is amazing. Tremendous efforts go into our large neighborhood events and fundraisers like the Flea Market, Home Tour, or Woodruff Casino. 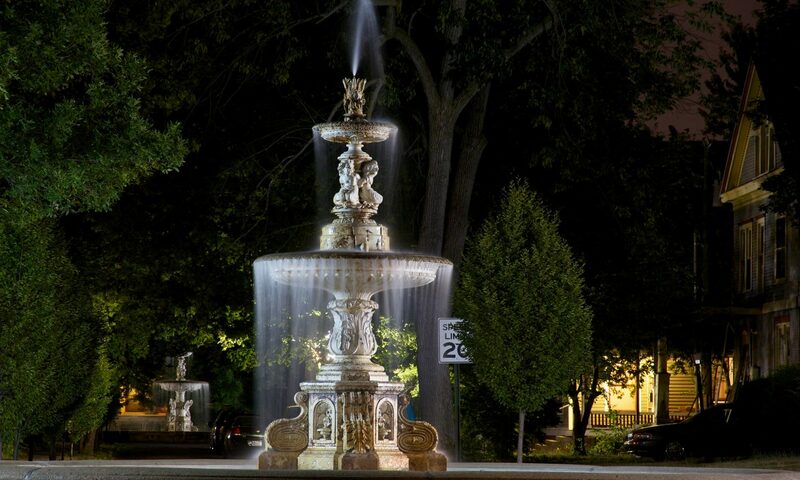 The Fountain Heads’ work on the fountains, the Light Brigade’s historic lights upkeep and improvement, and the Hall Monitors’ Town Hall efforts are just part of the work that happens, often unheralded, by our neighbors. But these are only part of the volunteer contributions of neighbors. Other critical contributions of time and effort which include participation on the various governance bodies, the twice a year clean-up days, maintaining and updating the website, production of the newsletter, maintaining the gardens at the end of the drives, picking up litter, painting and cleaning Town Hall, painting and expanding our amazing collection of urns and statues and innumerable other ways large and small. Look out for announcements for our 2017 fundraising drives and for many other ways you can contribute through the critical hands-on work of the neighborhood. The Civic League Board and the Foundation will be looking for new and enhanced ways to recognize all of these efforts.